Over the course of its 17-year career, Dead Can Dance (Lisa Gerrard and Brendan Perry) created some of the most moody, challenging music of their generation. They explored gothic vibes and the power of voice freed from the straitjacket of lyrics. They modernized the power and enchantment of Medieval chants, crafted long instrumental soundtracks of tension and ghostly beauty, incorporated eerie scales of Eastern meditation music and even dabbled in progressive folk. From the start they created soundscapes of alternative rhythms and instruments, heavy on twining basslines, reverb, strings and mystery, and utilizing both the heavy tones of Perry’s sonorous bass and the quavering explorations of Gerrard’s alto. 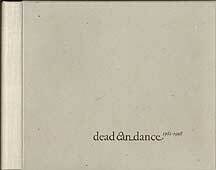 Dead Can Dance was one of the earliest signings of England’s alternative boutique label, 4AD. And over the course of the early ‘80s, the band helped define what was to become known as the 4AD sound and style, releasing a series of ever-broadening albums with evocative, non-traditional album cover art, and dense, dark, and dramatically moody explorations of sound and timbre. Along with Cocteau Twins, Throwing Muses, Colourbox and Pixies, they formed a cadre of 4AD artists that refused to make traditional music, that pushed the boundaries to create not just a sound, but a movement. Occasionally, the entire 4AD stable came together to become This Mortal Coil, another boundary-pushing collective that turned up the reverb, the mystery and the shadows for three collections of excruciatingly beautiful, dark music. Theirs is the music of the hidden spheres. The music of “just beyond.” Rhino Records has worked with 4AD to pull together a typically complete box set covering the band’s entire career, from early demos and radio recordings to a song from their final (previously unreleased) recording session in 1998. The box set includes three CDs totaling 47 songs as well as a DVD disc that features an hour-plus concert movie Toward the Within, as well as gorgeously avant, evocative videos for “The Carnival is Over,” “The Host of Seraphim,” “Yulunga [Spirit Dance],” “Frontier,” and “The Protagonist.” The discs are stored in a small cardboard and canvass bound booklet that includes dozens of arty photos of streets and homes and landscapes, as well as an extended biographical history of the band. This is a must-have collection for fans of the darkly evocative. Portugal’s Dulce Pontes set out to make an organic record, a CD of music representing the four elements of fire, water, earth and air. Singing in her native Portugese, and using acoustic instruments, often dominated by Spanish guitar trills, she has created an exotic album of foreign folk and ethereal beauty. At times, her music seems classic in its form and structure, and at others, her soaring, skating vocal dancing seems almost angelic. Since nothing is sung in English, it’s not an easily accessible album for English speaking audience if you’re looking for lyrical meaning. But if you’re looking for emotive passages and evocative cadence that roams from the medieval chant to the modern rhythm play, from Renaissance-like progressiveness to Sarah Brightman-esque operatic tone, Pontes offers a beautiful stroll through a range of emotions and musical colours. Fans of the tonal adventures of Dead Can Dance will find a familiar – if less moody – tapestry in O Primeiro Canto. Nobody has done a better job at combining techno dance beats and warm synthesizer buzz with ambient (usually) female vocals and exotic melodies than Enigma. The brainchild of writer producer Michael Cretu, Enigma has sold 30 million copies of its four CDs over the past decade and taken its sound from the shadows of dance clubs to the top of the charts thanks to singles like “Sadeness Part 1,” “Mea Culpa Part II,” “Return to Innocence” and “Beyond the Invisible.” Those songs and 14 more – including a new track, “Turn Around” – appear on Love Sensuality Devotion: The Greatest Hits, now available from Virgin. This is the perfect soundtrack for closing your eyes and being transported from mundane life to an ethereal – but still pulsing – dance floor.